I've found my favorite new salad dressing. The ingredients were a little tricky to find, but well worth the search. Put the ingredients into a blender or small food processor, and mix until opaque. That's it. It's quick to put together, doesn't take much to dress a salad, and tastes great. From the first previews, I was convinced Juno would be my favorite movie of the year. And I really enjoyed it, although by the time I finally saw the movie it almost felt like deja vu. As with many movies, the best lines had already been repeating on my television for weeks. What surprised me is that tonight, Lars and the Real Girl took that favorite movie spot. It's been a long time since I saw such an endearing movie. And it had a level of symbolism, care, and detail that I wasn't expecting. It's funny and sweet and just a surprisingly good film. I highly recommend it. I know that the current political system has been around for a long time and so far it has been arguably tollerable, for the most part. However, I can't help but feel that there are a few places where it can be tweaked. I may not be well versed in every element of the political process, but I would like to put forward a couple ideas. 1. Instead of having the electoral college members all vote for whoever won in their state, why can't the vote be more representative of the actual numbers? For example, if a state's population went 60% for candidate A and 40% for candidate B, why couldn't 3 of the electoral votes go to one candidate and 2 to the other. That's a simplification, but I'm sure you get the idea. The details still need to be worked out, but that seems to me like it would be the perfect way to ensure that the candidate who wins the general election becomes president. 2. I happen to agree that Iowa and New Hampshire get way too much attention and power during primary time. A friend suggested that each time the presidential primary season comes up, a few states are chosen to be the first to vote. That way, a few states can get the attention and really sort through the candidates, yet it isn't the same states getting all the say all the time. As far as I can tell, it would be fair and sensible. Last night, Chris and I went to Wolf Trapp National Park in Vienna, VA to see a concert. If anyone has not listened to Pink Martini, I recommend that you do! They were absolutely amazing and we really enjoyed ourselves. I love the variety of the music and the infusion of different sounds and music traditions. I've liked the music for a while and it was great to get to hear them live. And the concert venue is quite civilized, which was good since Chris is a bit particular about the whole concert scene. Taking a friend's advice, Chris and I netflixed OutFOXed last week. If you haven't seen it, it is incredibly interesting and worth watching. However, I'm not sure it says anything new. We all know that FOX news is right-wing entertainment and does not actually qualify as a news program by any stretch of the imagination. And I already know I don't want to watch FOX news because it will upset me but this documentary has so many clips from the show that I might as well be watching the actual show. It was nonetheless interesting, especially the way they interweave the FOX news slogan of being fair and balanced with clear cut instances of them being the farthest thing from fair or balanced. I put it in the same category as Who Killed the Electric Car; it's illuminating and informative if you don't mind getting frustrated and annoyed at some of the awful people who live in the world. What it has done is taken my dislike of their news show and turned it into a boycott of other shows on there that I used to like such as 24 and The Simpsons. Did you know that FOX also owns the New York Post. It figures. I think the only real issue in my boycott is going to be 20th Century Fox movies. Anyway, I just wanted to pass along my humble review. I've actually had inquiries about the Greece trip from the pictures I had posted on here and advice for travellers there. This has been really cool and I'm excited that having a blog means I may have readers who want to know my opinions. Due to this, I'd like to start a travel section to this blog. It may be like the word posts that never really came to anything or the drew ultimate history that fizzled with the first post due to lack of participation, but on the other hand, it may not. It's been a while since I started this blog and it still hasn't quite found its niche yet other than a sounding board for my ranting. I'd like it to become a little more than that, so here is a new possible direction that I'd like to explore. It has come to my attention that the exchange rate from US dollars to UK pounds is horrible. At 2:1, it makes an already expensive city even moreso. At Chris' suggestion, here is a travel guide for the cost conscious London traveller. Having been a college student in London, I learned a thing or two about seeing the city on limited funds. I hope you find some of these pointers helpful. The following ideas are in no particular order. Take a minute to go on line and find useful bus routes. They aren't that hard and cost half what the tube does. Look on travel websites to book a cheap hotel near the center of the city. They're expensive there but deals can be found online beforehand. And if you're near most of what you want to see, you'll save a lot of money on transportation as well as time in transit. If you don't want to spring for the Heathrow Express, consider taking the Picadilly line. 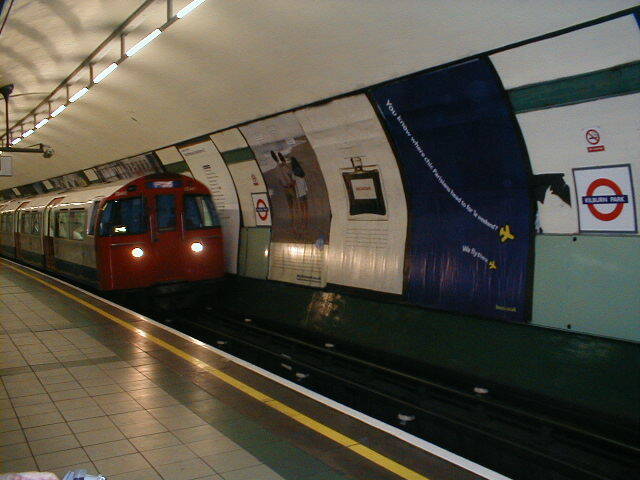 For considerably less, although a bit more time, you can ride the Underground right into the heart of the city. The airport is far away, so the train and the subway are probably your best bets. 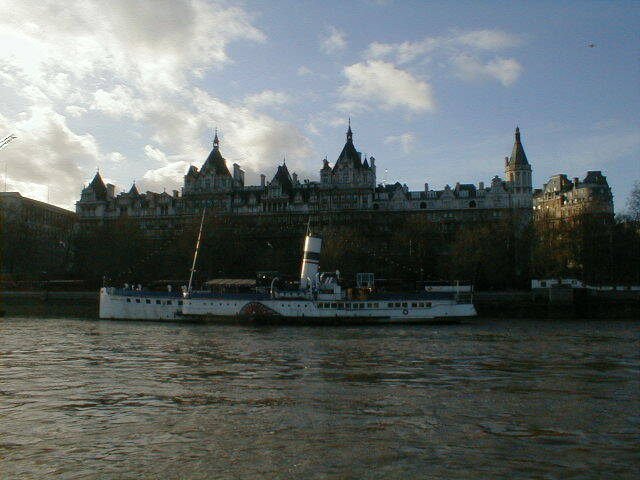 If you need to get somewhere down the Thames and it's too far to walk, consider taking the ferry. It's twice the cost of a tube ride, but the views are great and it's more than worth it. 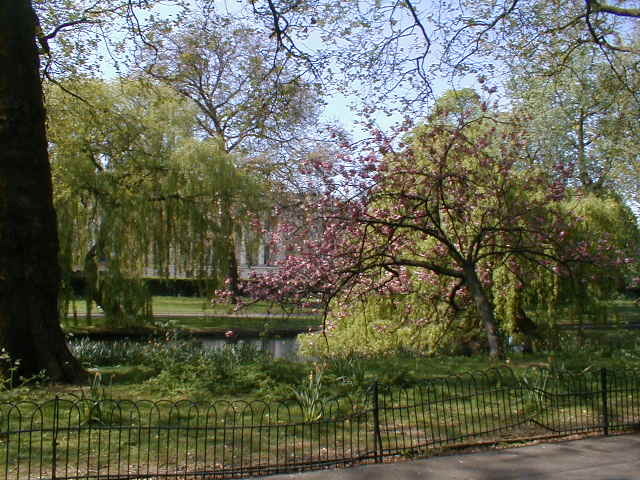 Some of the best things in London are actually free. If you get a chance, hit the British Library. They have a great collection of rare works like the only surviving Beowulf manuscript, Caterbury Tales, Shakespeare's First Folio, Beatles lyrics scribbled on napkins, works handwritten by Mozart, Alice in Wonderland, antique maps, and all sorts of other stuff. There's something for everyone, it's free, and there's hardly ever a crowd. You can peruse the works to your heart's content. It's one of the city's hidden gems. The British Museum is free and worth a stop. It has the Rosetta stone and a great collection of sculptures taken from the Parthenon. It also has pieces of that Mausoleum in Turkey that was one of the seven wonders of the ancient world. Very, very cool stuff here. The Museum of London is a great place to start any trip to London, with artifacts dating from pre-historic all the way up to modern and everywhere in between. With such a rich history, it's an interesting place with great Roman London pieces. It's also free. Other free museums that are worth a look if you have more time are the Imperial War Museum, Victoria and Albert, National Portrait Gallery, Natural History, and Science. The Tate Modern and Tate Britain are both great, free museums that I would recommend if you're into Modern Art or uniquely British art. 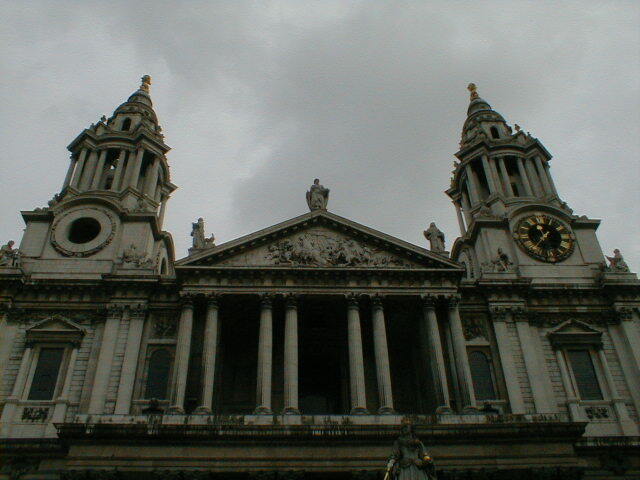 St. Paul's Cathedral is a must see, but expensive. If you just want to go in and have a peak, go in at 4:30, after it's closed to tourists. There are no annoying tour groups and no cover charge. If you're there at 5pm, you can also stay for the free evensong concert which has a choral group performing each evening. This is every day except Sunday, when it's closed except for services. The changing of the guards at Buckingham palace is fun to see and also costs nothing to attend. It's a great parade of royal guards in tall, funny hats and British pomp at its finest. You can usually get into some good shows for very little. Just don't buy the programs since they're usually expensive. Even if you go see something small off the West-End, see something. Theater is a big part of London. If opera's more your thing, go to the National Opera House at 10am and you can get 3 pound seats for that evening's performance. You won't find a much better deal than that. A lot of theaters also have rush tickets available for 50% or more off the regular price of admission. Look into what you want to see before you go, because if you just pick what's being advertised in Leicester Square, you probably won't be getting a very good deal. The good news is that a lot of the food England is known for is cheap, filling, and good. Well, opinions differ on the good part, but it's all part of the experience. If you want to go to a nice restaurant, try to go to lunch there because dinner prices go up quite a bit, especially in center city. Otherwise, look for a non-touristy pub and you can find a pint and a meal, be it fish and chips, bangers and mash, or something else on the menu, for under 5 pounds. Depending on where you are, it could be a bit more. Believe it or not, the British have great Indian food. Indian take-out is a good option and is usually pretty reasonable. Their national dish is actually considered Chicken Tikka Masala. It's usually more expensive to eat in than take out. So if you're lucky enough to be there when it's not raining, you may want to find food and bring it to a park. They're scattered all over the city, have lots of benches, and are well tended to. Well, if you can get it elsewhere, do. You won't find many deals here, unless you visit in January when stores have their annual sales. Harrod's is definitely worth hitting then. And even if you aren't buying anything, it's worth going to this block big store in the heart of London's shopping district. If you feel the shopping bug, you may want to check out Portobello Market or some of the other markets around the city that still have some deals. Not many, but some. Otherwise, I'd save bringing home souveniers for another destination. 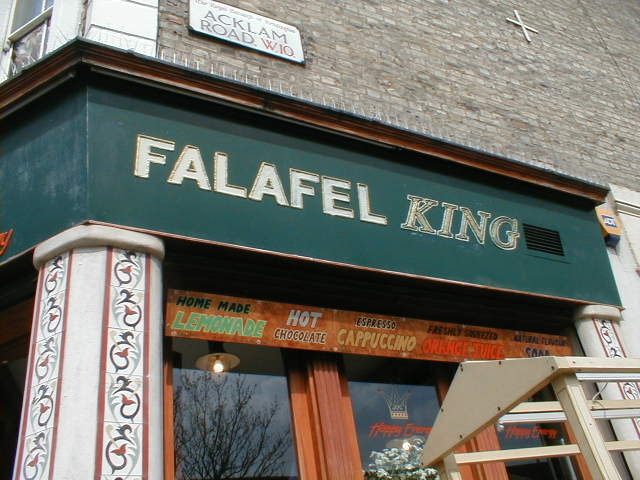 Oh, but if you do go to Portobello Market, be sure to stop by the Falafel King on Portobello road. It's amazing. If I think of more things, I'll add them, but for now, those are my tips on seeing London for less. I hope they help if you're planning a trip there. So I just finished watching the Felicity special. I couldn't help myself; it was on instead of Gilmore Girls. And besides, Julia Roberts was the executive producer and I was curious. Now I'm trying to figure out if the books were really that awful and I just never noticed or if the production was the problem. It was nice and all, but an English accent doesn't necessarily mean that all speech has to be stilted and pretentious. Perhaps that's how they spoke, but it didn't work very well as far as engaging the audience. That and the plot was very simple and often repeated. I suppose that part was the same as the book. I do realize that currently I am not their intended audience. Not the best Christmas-y special for this year, if it was supposed to be Christmas. Okay, I'm going to forge ahead here. Incidentally, the rain seems to be letting up. Chris and I went to see Wallace and Gromit The Curse of the Were-Rabbit a couple weekends ago. We had enjoyed the shorts and were curious. And who doesn't like a little claymation? I liked it. It was entertaining for a wide range of audience. Well, it was entertaining for kids and for grown-up kids. Gromit is by far the best character. I had read some reviews beforehand and for once, I completely agree with them. It's very cute and funny and since I don't like horror movies, it was a perfect Halloween film. That's one of the first lines of "Who's Afraid of Virginia Woolf? ", a show that I went to see last night. And may I say, that performance was anything but. It was....wow. It's been a long time since I hung off of every word of a show like that. Four actors, three hours, and one amazing ride. There are few plays that are so cuttingly clever with such corrosive wit and destructive passion. And I had forgotten just how funny the dialog really is. The material is amazing and the performers really did it justice, breathing life into words that speak for themselves. It was a brilliant performance of the play as it is written. It is riveting and engaging and is exactly how it should be. If you're looking for innovation and interpretation, you probably won't find it here. But the cast is very strong and it is a faithful portrayal of a classic that is one of my favorites for its rapid-fire repartee that starts out seeming so bantering and yet quickly builds into something infinitely more meaningful, if dark. It closes soon and if you have not yet seen it, go. It's more than worthwhile. All the critics weighed in months ago, but now it is time for my write-up on Spamalot. And this reviewer says…*drum roll*….it was good. *cymbal crash* It didn't completely live up to my wildest expectations, but it was a highly enjoyable show and I'm glad I got to see it. Chris and I went to see it this past Sunday. We had a great day in the city and finally got to see a show we've wanted to see for a while now. I love the movie and have been waiting anxiously with tickets in hand for 5 months, so really, I doubt anything would have really lived up to my expectations. But on the other hand, it would have taken a lot of work for me to dislike it too, as long as it retained some of the original movie. A few of the reworked parts were a bit forced and they jarred with the Python humor. The classic pieces held up well on stage. The actors did a phenomenal job with what they had to work with. David Hyde Pierce made a great Sir Robin and Tim Curry made the role of Arthur his own. It was campy and funny and they did what they could. For that I applaud them. And yet something was missing. Python is such a dry, quick and understated humor, yet there were too many "laugh here" moments in the play. Monty Python just isn't the place for male flamenco dancers singing a song about a knight being gay with lyrics like, "He can finally come out and say that he is G-A-Y-...M-C-A!" It's far too…..unsubtle. Maybe not even that since Python is often over the top. But when they are, it's more clever or absurd, I think. Perhaps, as Chris says, we're just both purists when it comes to Python. We've just seen the original one too many times and love it to pieces and the play could never compare no matter what they did. However, it was good and I'm glad I saw it. I just will not be returning for an encore soon. Especially if tickets remain as elusive as they have been. But if you have not yet gone and you get the opportunity, it's fun and I recommend it. I just realized that I do not come up under the search results for my full name. I can't, afterall, be the first search result for Jessica Ek and not Jessica Lyle Ek. Therefore, this is a post to rectify the situation. I suppose Jess Ek should also be on the list. That is all. As many others have already stated, it was the best of these new-fangled movies by far. Still whiney and not quite true to the campy Star Wars tradition, but decent. The writing was poor, but it's Star Wars. The banter in the original movies was entertaining, but not all that much better writing. Just less whiney, really. This last one tried to get back a little of the dry sarcasm of the originals, but this was far overshadowed by their reliance on physical humor. This was a bit frustrating. Also, Padme sucked. The character was ridiculous in this last movie and cried the whole time. Not cool. When droids are so effective against everyone but jedi and the jedi have been all but exterminated, why did they go back to primarily storm troopers? A few things like that don't make sense. I mean, why did they need clone wars when they had fighting robots that could shoot things and provide comic relief at the same time? I know on some level that no movie would have lived up to the originals in my mind. However, many of the books have been fantastic and I've loved almost as much as the movies, so I don't see why this is the case. This leads me to believe that the movie could have been better. Maybe it was hard to create new, rounded characters to love, but I find that hard to believe since characters like Marra Jade and the jedi academy trainees were introduced later on and connected effortlessly to the Star Wars universe. I'm a dork, but I loved those books even though I knew they were just like junk food; wonderful and addictive yet empty calories somehow. I'm happy the prilogy's done. I'm glad I saw the movie, was not completely disappointed and that it ended on an up note. I'm left a little frustrated, after all the coolness of the first Star Wars movies, that was all the Star Wars story would become. This was an interesting production and it definitely picked up in the second half. The setting was appropriate and the sound and lighting was very much in tune with the New Orleans feel. The staging was, for the most part, very good and only distracting at a few points. My main issue came with the casting. They had some great names in it. Blanche was played by Natasha Richardson. But she was far too much of a stage presence to be an anxious person with delicate nerves. She tried too hard to be flighty, then in the moments when she's being candid, she was far too grounded and solid a character. Stanley was the same person who was Roxy's husband in Chicago. He's been in a bunch of stuff and is a great supporting actor, but he doesn't quite have the magnatism for a Stanley. You really don't quite see what Stella sees in him, in the dark or otherwise. So I think that played a part in the first half dragging so much. There were some shining moments though and these places made me see the play in its own right instead of comparing it to the movie or my own preconcieved notions of what it should be. And those moments made it worth seeing.